I have been in dialogue lately with many followers of or people who are at least influenced by Gordon Clark. I would like to start a blog series on dealing with the philosophical positions of Clark, specifically, his epistemology. However, before I begin a review of his theory on knowledge, I need to deal with a few issues that will clear the way for a clear conversation on these issues. To lay all my cards on the table up front, I am squarely in the Van Tilian school of epistemology. As soon as a Clarkian hears this they want to throw the charge out that Van Til was a heretic (I know this because it has happened to me about 15 times) because of a comment he made about the Trinity. I do not believe that Van Til is a heretic and further, I think he is completely orthodox in his understanding of the Trinity. However, I do not wish to defend Van Til on this point here. Rather, what I want to do, is point out that Clark made many claims about the Trinity that are as troubling, if not more troubling, than Van Til's comment that God is three persons in one person. My goal in doing this is to disarm the Clarkian claim about Van Til by showing that Clark was not as "squeaky clean" on issues of the Trinity as the Clarkians let on. In his book The Incarnation, Clark deal directly with the theological issues surrounding the second person of the Trinity becoming a man. After raising may valid questions that the Incarnation raises, Clark begins to answer these questions. It is in these answers that Clark allows his desire to be "logical" to lead him astray. "On the cross Jesus said, 'I thirst.' No Trinitarian Person could have said this because the three persons are pure incorporeal spirits and thirst is a phenomenon of the body" (Page 73). Notice that Clark claims that no Trinitarian person said "I thirst." However, Jesus made this statement. Thus, Clark concludes that Jesus must be both a human person and a divine person (he affirms the divinity of the Logos in earlier sections). 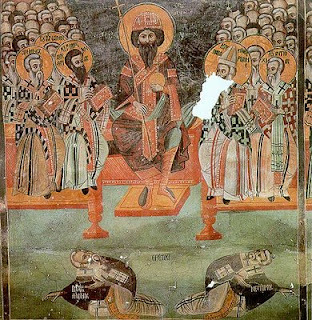 This view of Christ being two persons is known as the heresy of Nestorianism. Clark know that he was flirting with the line between the orthodox understanding of the Trinity (which states that Jesus is only one divine person) and Nestorianism. "Some unfriendly critics will instantly brand the following defense of Christ’s humanity as the heresy of Nestorianism" (Page 75). Clark is right that people will call his view Nestorianism, because it is. However, notice Clark's use of the fallacy of poisoning the well when he says that those who will call his view Nestorianism are "unfriendly critics." Whether or not a person is friendly is irrelevant to the accuracy of labeling a view, if your view is Nestorianism, it is right to call it that. I realize that this discussion is brief, however, that is the nature of a blog. But, I think that this post is sufficient to at least show that Clark made some troubling statements about the Trinity. I hope that this will disarm the ready response of the Clarkians to call Van Til a heretic and will allow us to discuss the merits and/or demerits of both Clark and Van Til's epistemology in the future. Well done, Josh. Well done! I have always heard Clark was a Nestorian, but this is the best summary of his position. Why didn't Clark say that Jesus thirsting was part of his human nature? Do you think that would have gotten him out of his dilemma? Also, Van Til's view of the Trinity was not just a comment he made, but was what he taught in his syllabus. First off, I am glad you posted the link to that audio. Others can listen if they like. However, as I said in the post, I am not interested in getting into a "no-your-guy-is-a-bigger-heretic" conversation. If you would like I would not mind, one time, explain why I think Van Til is not a heretic, but for me that is a side point to the bigger issue of epistemology. Heretics can good theology in other parts of their thinking (other than the heresy that is). Second, here is a link to a full review of the book. I have not read all of it, I skimmed it a few weeks back. Let me know what you think if you read the whole thing. Third, what did you think of the post? Do Clark's comments set uneasy with you? Do you see how Clark's view might be Nestorianism? I am interested to hear what you think. 1) I posted the link to the mp3 because that was my source for the claim that Van Til taught his view of the Trinity in his classes. Correct me if I'm wrong, but what I hear you saying is that Clark's view of the incarnation is firmly rooted in his epistemology, therefore, if it is wrong, his whole epistemology is wrong or dangerous? At the same time you seem to be claiming that Van Til's view of the Trinity is unrelated to his epistemology and therefore irrelevant to the current discussion. VT's Trinity is just as firmly rooted in his epistemology as Clark. 2) I tend not to like a lot of what I read from McMahon, but when I get some time I will read it. 3) Your post does sit uneasy with me. However, I have not read Clark's book, so I am reserving judgment until I do. He also never fully finished the book and it was published post-humously (not that that's a defense, just something to take into account). Other comments I have read from people indicate that it is not Nestorian, though there may be some similarities. I think it is very wise of you to read Clark on this issue yourself before you make a discussion on it. As to the point of my post, I was not trying to say "that Clark's view of the incarnation is firmly rooted in his epistemology, therefore, if it is wrong." The point I was trying to make is that Clark says some very unsettling things about the Trinity, thus, Clarkians should drop the argument against Van Til that says Van Til's philosophy is wrong because he is a heretic on the Trinity. This argument is used ad nauseum by Clarkians and should be dropped. However, I do think that both Van Til and Clark's epistemology effect and influence there theology. Clark wanted to be so "logical" that he steps over the historical rails that have been set up by the Bible and the Church, each having different authority, but authority nonetheless. You are incorrect that Clark's view is Nestorian. Because Clark defines "person" differently than the ancient Nestorian position would, he can't be a Nestorian. Thus, if you want to conclude that Clark was a heretic based on this book, you'll have to do it by refuting his arguments on Biblical and logical grounds. You can't do it by simply calling him a Nestorian. This was a major issue throughout the book. Clark expressed frequently that some of the difficulties in the doctrine of Incarnation arose from the lack of a clear definition of person throughout history among Nestorians and non. You came to your conclusion probably because you didn't read very carefully. I really have a bigger problem with Van Til's definition of analogy than his view on the Trinity, by the way. It's pretty clear that he held this position and it wasn't just a "comment". If there is no point of identity between what God thinks and what we do, then when we understand him to say "I love you", we have no guarantee that he doesn't think "I hate you". Ronald Nash sat down with Van Til once and asked him if two plus two was four for God, and Van Til had no answer. This is the real distinction between Clark and Van Til and why Clark is preferable. For Clark God thinks that two plus two is four and that believe on Jesus and be saved doesn't mean believe on Jesus and be cast into hell. I'm sure that Van Til actually had some good things to say. I don't think Clark was 100% right about everything, and I don't think that Van Til was 100% wrong about everything. However, one's methodological choices affect all the doctrinal choices one makes. Van Til's rejection of the methodological priority of logic puts his entire theology on uncertain grounds. So I ask, why would you order your understanding based on it?